Ten years have passed since it was made mandatory for two-wheeler riders to wear helmets in city corporation limits in the state. 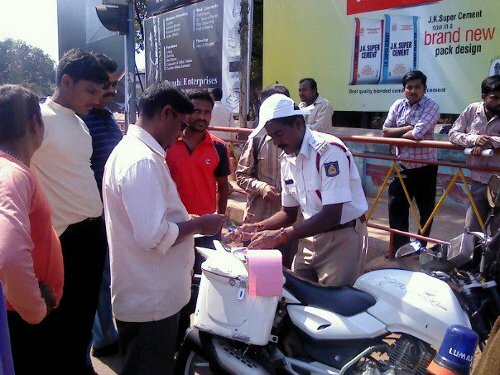 However, in Belgaum, the rule remains on paper as a majority of riders give the helmet a miss. The law mandates that wearing of helmets is compulsory for two-wheeler riders. IGP Northern Range Bhaskar Rao and Police Commissioner designate for Belgaum has said that wearing of helmets would be implemented strictly and also the under age drivers would be fined. Awareness is the need of the hour, Bhaskar Rao said adding if colleges make it mandatory for students to wear helmets, it will help a great. Traffic police will launch a drive for strict enforcement of helmet rule in the City with helmetless driving accounting to about 40 per cent of deaths in road accidents. The High Court had directed the state government to make wearing of helmets mandatory in 2004. Not wearing Helmet to head while riding the Vehicle is liable for a a fine of Rs.100 u/s 230 of the KMVR 1989 in sub rule (1). Law of the land has to be agreed upon by the people living in it. But the question arises or remains why this has to be done every now and then and why they let it go if implemented. Then what about the Auto meter rule are they going to implement the same or again a big tamasha and people start to suffer more than they were by the Auto drivers. the people should realize that it is for their good only that this law is being implemented. and as rightly said many of the accident related deaths are due to helmetless driving in two-wheelers. what we need is a strict commitment on the part of the district administration and police to enforce this law effectively. toherwise this hype will also be a thing of past in few weeks.